Australian health experts are calling for the humble sandwich to make a return to school lunches in 2018. With many parents feeling the pressure to provide kids with fancy foods, health experts are telling parents not to be afraid to pack a stress-free but healthy sandwich this school year. The push for sandwiches comes from Nutrition Australia and the Grains & Legumes Nutrition Council who are running the inaugural healthy Lunchbox Week between 22 – 29 January 2018. The two organisations say parents make an average of 200 school lunches a year for each of their primary school aged kids. With so many lunches to organise, the groups say parents need to turn to lower stress options like sandwiches. 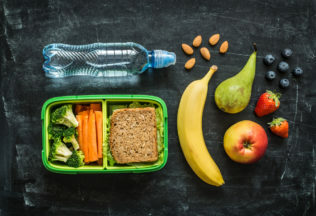 “Kids eat around a third of their daily food at school, so what goes in the lunchbox matters, but preparing the, can be a source of stress and frustration for parents,” Nutrition Australia spokesperson Leanne Elliston said. “Bread is a valuable food for growing kids,” said Grains & Legumes Nutrition Council Nutrition Manager, Felicity Curtain. As part of Healthy Lunchbox Week, a free webinar called ‘Bring Back the Sandwich’ will be available on the Nutrition Australia website from Wednesday 24 January 2018. Freedom Foods is expanding its Messy Monkeys children’s range to now include popcorn.